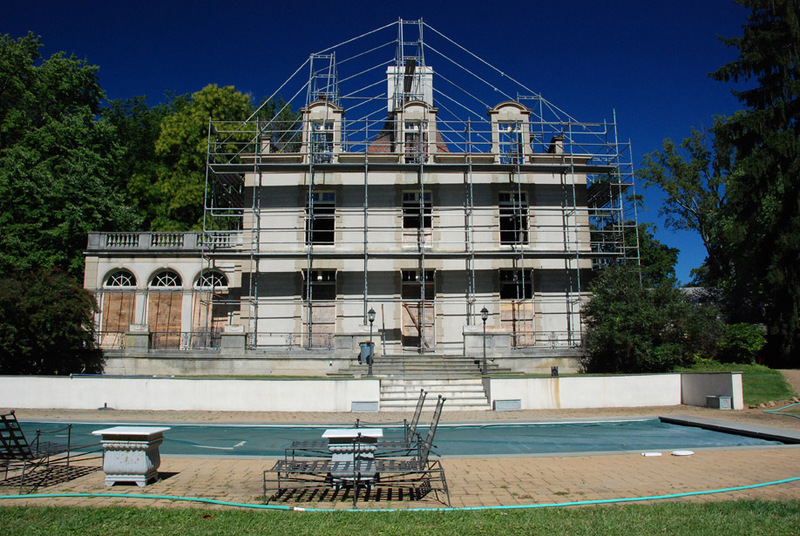 Scaffolding a burned out mansion. Where there’s smoke there’s fire and scaffold. 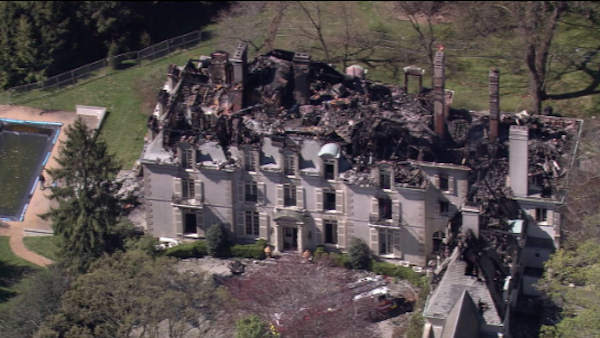 The famous “Bloomfield” mansion was almost “Gone with Wind” like Tara, or Xanadu in “Citizen Cane”. 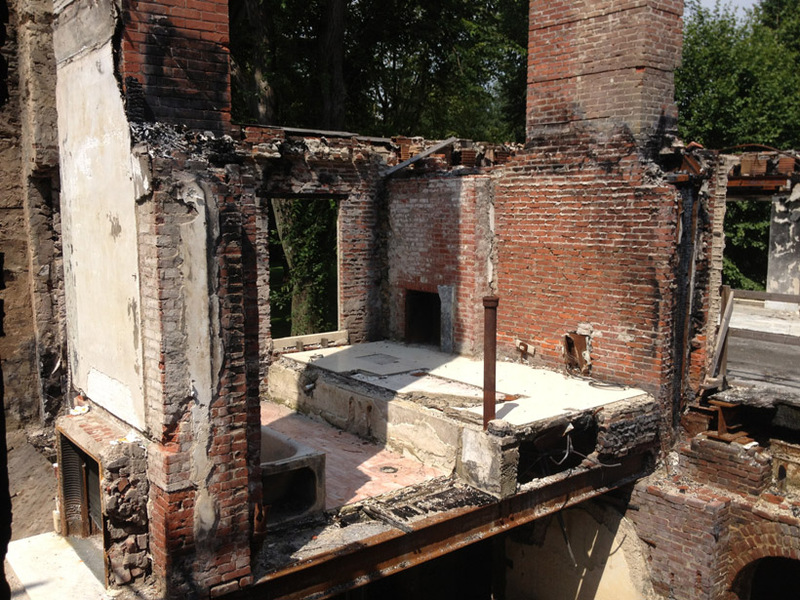 But firefighters were able to coral the blaze and keep the structure so it could be brought back to life like Lazarus. 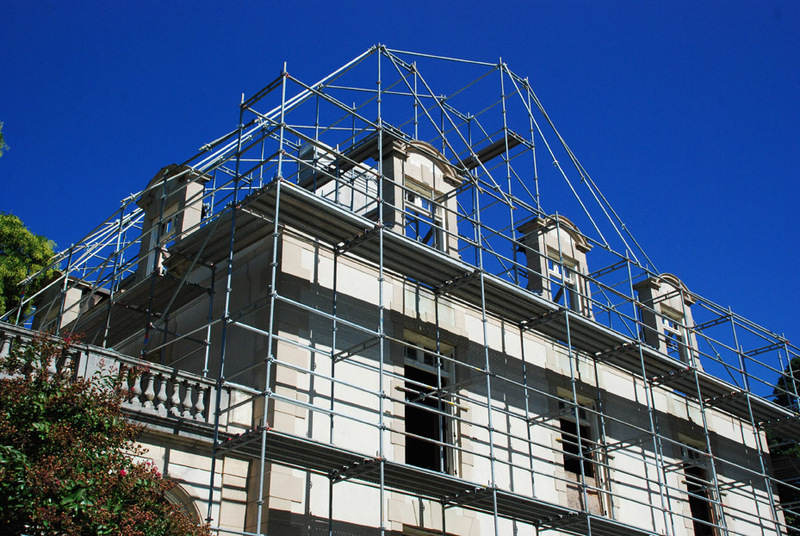 And that’s where Pinnacle Scaffold comes in to save the day. 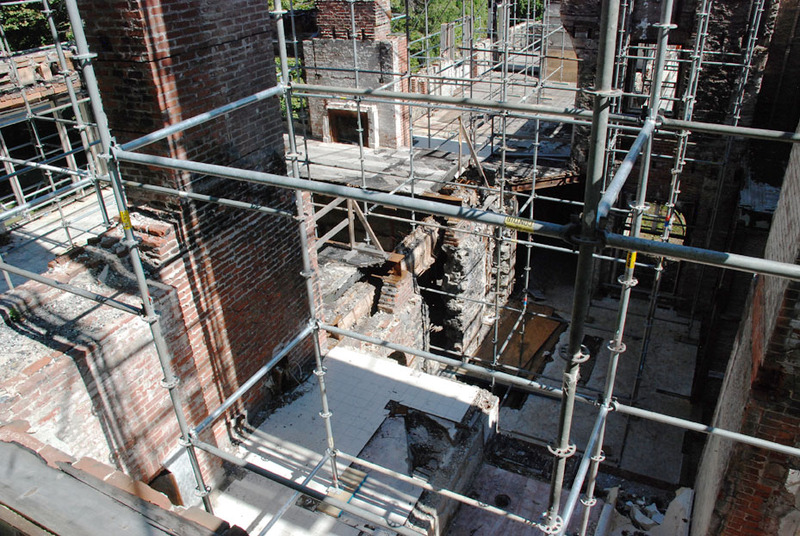 Pinnacle has a reputation for extraordinary work on historic properties and this was no exception. 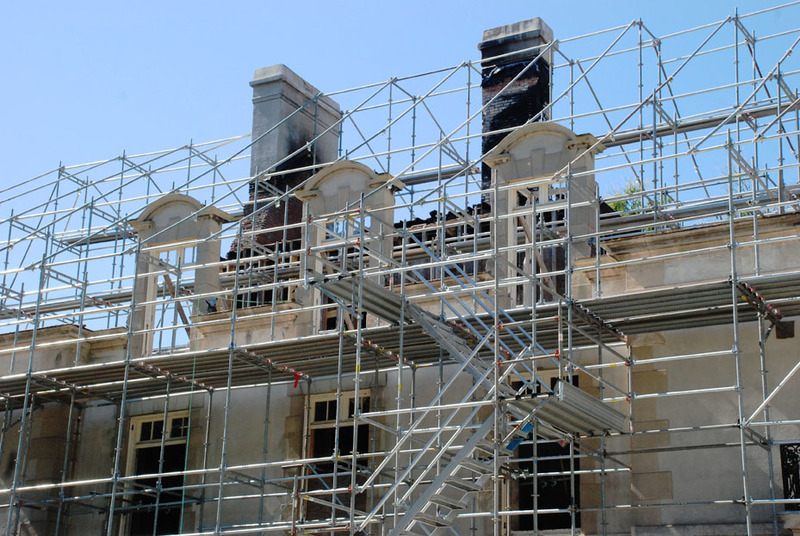 Scaffolding around a burned out shell of a house is no easy feat but our experts handled it with great skill – giving crews the necessary access and room to do their work. This Gilded Age Main Line mansion, known as “Bloomfield” was built in 1885 and later redesigned by architect Horace Trumbauer. 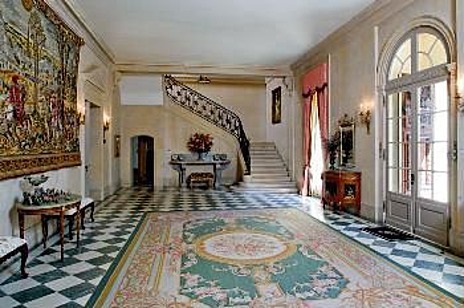 It boasts a grand ballroom, 14 bedrooms, 13 bathrooms and three power rooms. 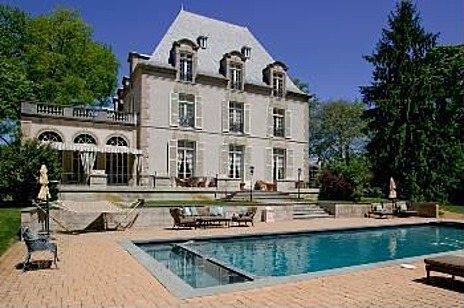 It has 24.000 square feet and sits on a 7 acre estate. Check out the slideshow of the BEFORE pics. It was movie set spectacular. In fact, it’s been in several movies over it’s lifetime. The home is part of what once was the George H. McFadden estate, which used to encompass most of the block. And it sits just down the road from the Villanova campus. The blaze, with apparently started on the third floor quickly spread and caused significant damage to the entire building. Current owners, Dean Topolinski and Julie Charbonneau plan to restore the home after the fast moving fire ripped through the structure April 4, 2012. 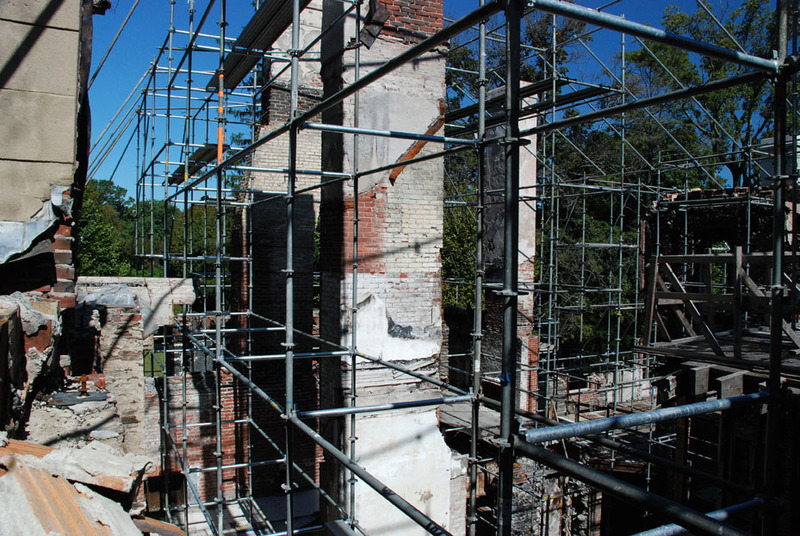 Restoring it to its former glory won’t be easy and is sure to cost millions of dollars. Just look at the interior before the fire. 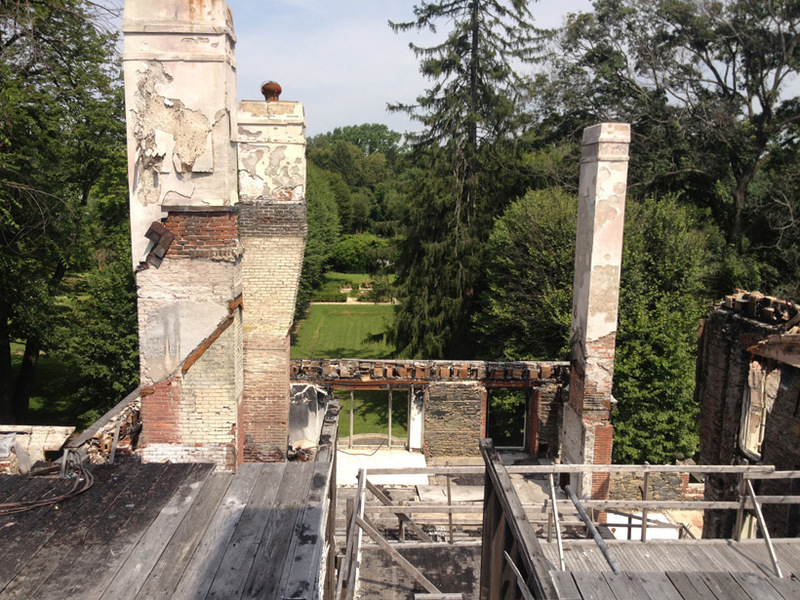 The house has been somewhat of a firestarter (had to say it) for gossip around the area. 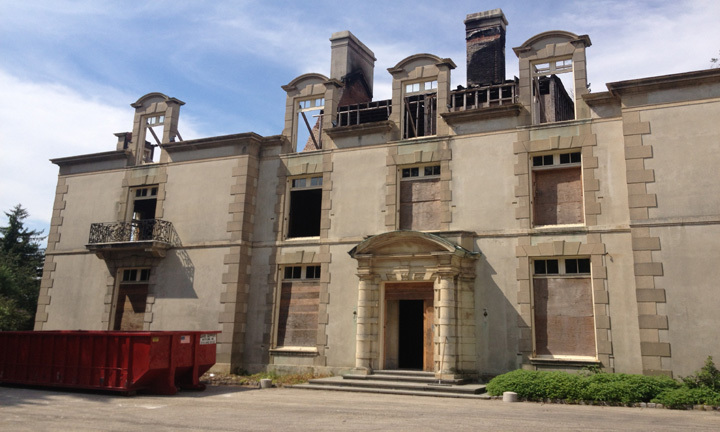 Accusations of arson and greed have been thrown around by both the past owner and the new buyers. I’ll leave that to you readers to decide. Either way, this is the second time on a year that Pinnacle Scaffold has been onsite scaffolding the old girl. As you can see from the photos, the real challenge was engineering a safe way to span the gaps and elevations all around this house. A big shout out to Alternate Design Solutions for working with us to come up with certified drawings for solving that problem. You can also see in the photos that here are numerous verticals and horizontals throughout. That is because the entire structure is going to be tented with debris netting. 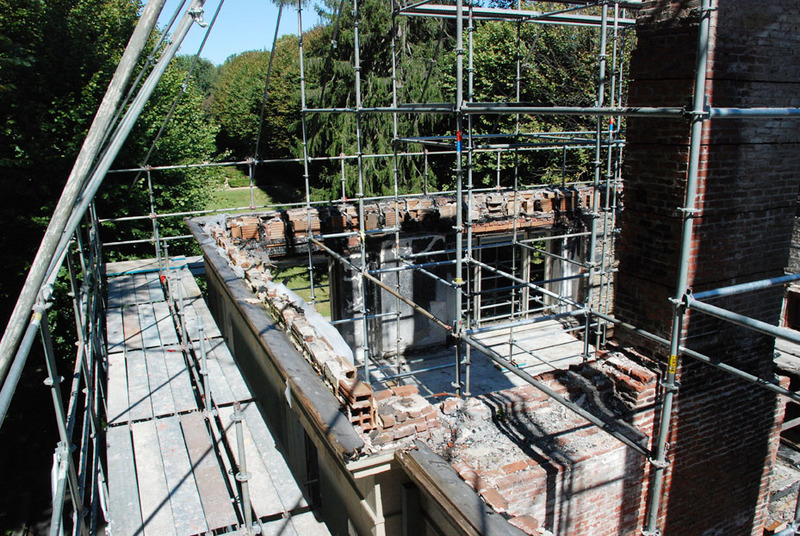 These extra supports are needed to keep it strong enough to withstand the elements. Crews plan to work straight through the winter on this project and it’s a wonderful way to keep the heat in and elements out when working in nasty conditions. 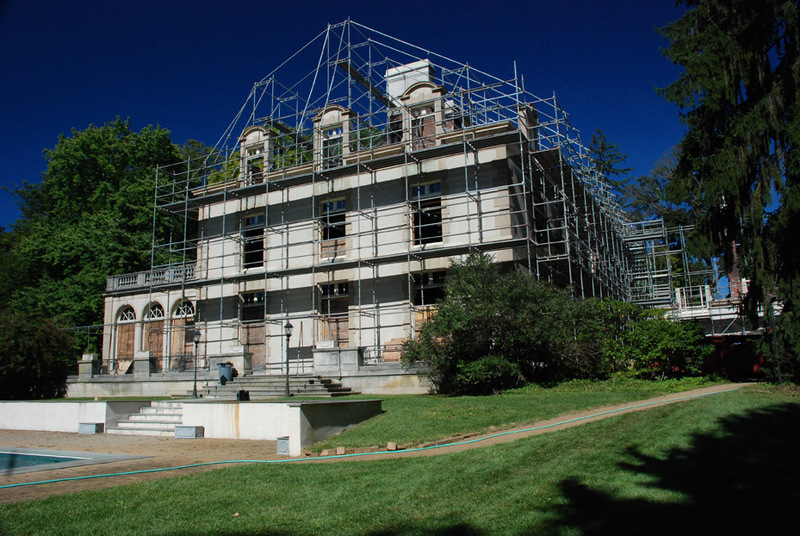 So, with the utmost care Pinnacle Scaffold came in and scaffolded the entire mansion giving crews access to both the front and back sides. We will update this when we have photos of the tented house. 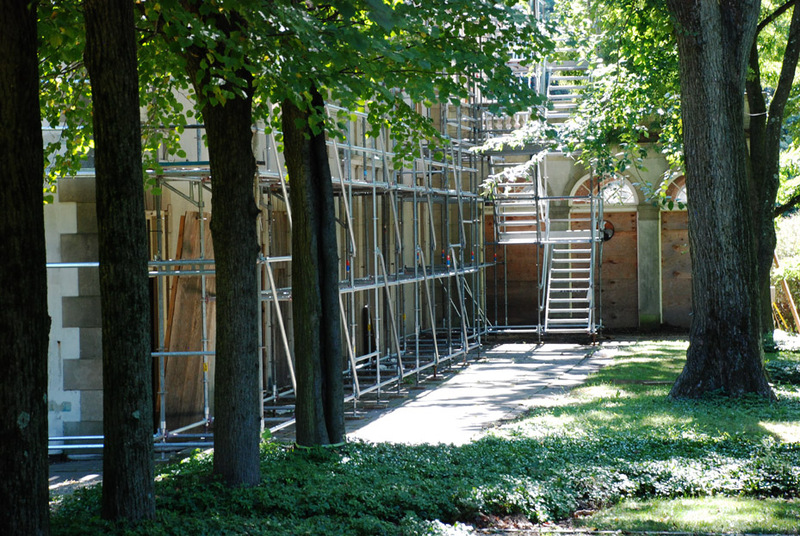 For any historic restoration or delicate work don’t hesitate to call the non union scaffold leader – Pinnacle Scaffold today. 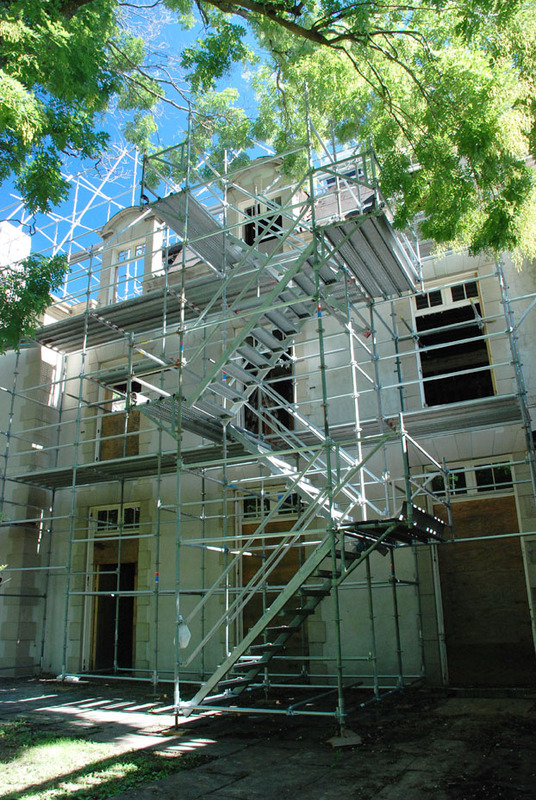 (302) 766-5322 or visit http://www.pinnaclescaffold.com. 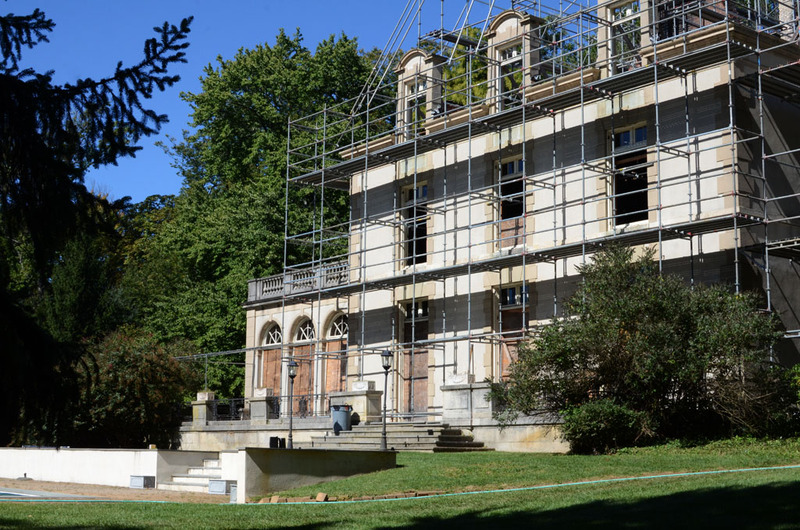 Trumbauer, a famous Philadelphia architect, designed an expansion and renovation to Bloomfield at the behest of George H. McFadden Jr., a cotton-magnate who bought the estate in 1911. The first home there had been built by naturalist A. E. Gallatin in 1883, according to “American Splendor: The Residential Architecture of Horace Trumbauer” by Michael Kathrens. 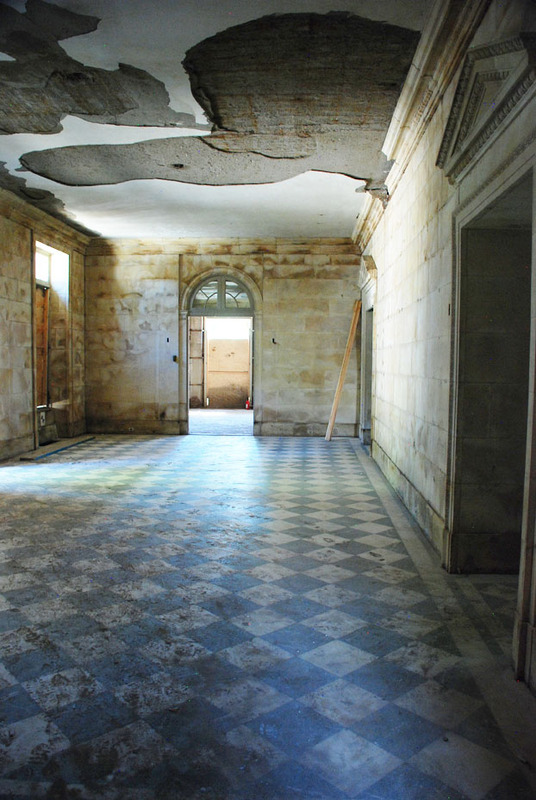 Trumbauer had transformed the original building, creating an entry hall lined with caen-stone, a creamy, yellow limestone from France, marble floors and a grand staircase with wrought-iron railings in the style of Versailles. 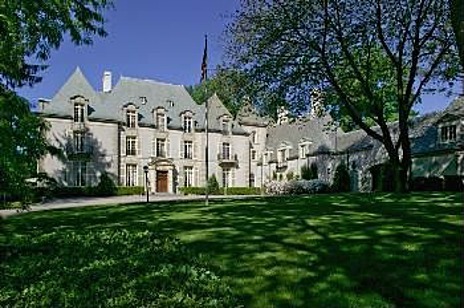 Outside, the Olmsted Brothers designed parks and formal gardens to frame the gracious chateau. 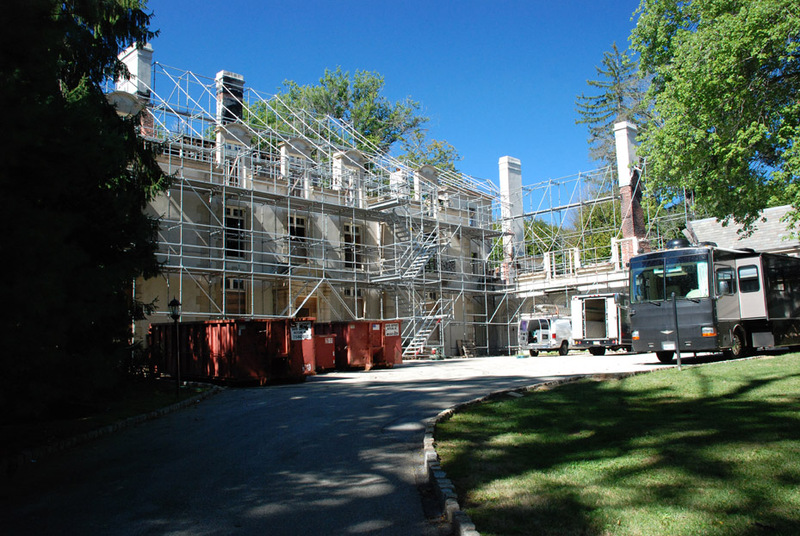 Although McFadden died in 1931 from an accidental electrocution from a steam cabinet in one of the home’s bathrooms, his family continued to own the manse until 1984, when the land was subdivided.